I visit Stone Gable often for Yvonne sets a beautiful table and has the most amazing menus for the week. And she has just started On The Menu Monday. So today, I thought I would play along. It wasn't on the menu on Monday -- we had it Saturday and though it really is more of a winter dish it did have peas and new potatoes which are really spring and summer foods. And it is cooked on top of the stove which doesn't warm the kitchen like an oven meal does. That is a factor when temperatures on the prairie the last few days are soaring to 100 and more! 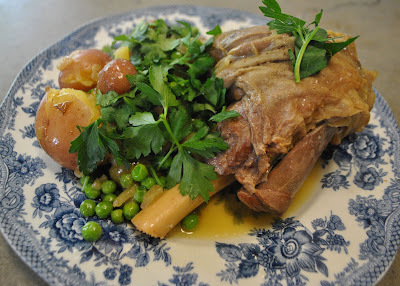 Moroccon Lamb Shank with New Potatoes and Peas. From my latest favorite cookbook, The Pleasures of Cooking For One, by Judith Jones (she of Julia Child fame). I bought the cookbook because it was on deep sale (Borders was going out of business) and because it had a cheese souffle on the cover. I had been yearning for a cheese souffle but a cheese souffle for two means that we'll either eat the whole thing or throw out half of it. For a cheese souffle does not reheat well. And on the way home from the city, we stopped at Williams Sonoma so I could buy the proper souffle dishes so that I could make that cheese souffle. It was the first thing I made from the book and it was really really good. We both enjoyed a nice souffle (I doubled the recipe) and didn't worry about overeating or throwing a goodly portion of it out! It is my new favorite cookbook and I rank it right up there with my beloved Barefoot Contessa and Anna Pump books. With lamb shanks in the freezer, I thought, this dish looked promising. We both love lamb shanks and the recipe was enough for two. With Farmer's Market new potatoes and peas from the freezer, it was an easy dish to prepare. Husband Jim pronounced it "wonderful" and suggested that perhaps I make it for our next dinner party especially if we invite lamb loving friends Anne and Tim. And it was perfect just for the two of us -- no leftovers!! Don't forget to check out other Menu Mondays at Stone Gable . . . and if you like lamb, these lamb shanks are fantastic!!!! Heat the oil in a small heavy pot or skillet and stir in the onion, garlic, ginger and saffron; then lay in the lamb shanks. Cook for about 5 minutes over low heat, stirring frequently and turning the shanks over. Pour in enough water to cover and sprinkle with about 1/2 t. salt and several grindings of pepper. Cover and continue to cook over low heat for 1 1/2 to 2 hours, until the shanks are very tender; check the level of liquid and add more water if necessary so that it just covers the shanks. Add the potatoes and simmer for 20 minutes, then add the peas, preserved lemon and olives and cook another 4 to 5 minutes. Put the shanks and the potatoes on a warm plate; then, with a fine mesh scoop, pick up all the peas and seasonings and scatter them over the meat. Pour on some of the cooking sauce and sprinkle the parsley and cilantro on top. NOTE: I doubled the amount of potatoes and peas since I served both lamb shanks. Very interesting...I have never cooked lamb shanks, although I love peas & new potatoes. Think this would make for a lovely dinner... I have only cooked boneless leg of lamb. Reading the recipe reminded me of a friend from England that brought me preserved lemons and numerous spices that she used in cooking! Thanks for sharing! I've never cooked lamb. But that looks like a very good recipe. I'm going to look for that cook book. My husband loves lamb shanks! Have to try it! New peas and potatoes. . .good homecooked food with any meal! Adore your blue & white dishes!!! Lovely photos! Anna Pump is a crony of Ina Garten (in fact Anna used to work for Ina at the Barefoot Contessa) and runs Loaves and Fishes near East Hampton (I don't think it is in East Hampton) and has appeared on Ina's show more than once. She is one of my inspirations. Lamb shank for dinner tommorrow nigt! love the blue and white dishes. i love doing shank as I can just pop it into the slowcooker and then it fills the house with its gorgeous aroma the whole day! Martha, Thank you for the lovely shout-out! Your lamb sounds and looks luscous! YOu did a beautiful job plating your dinner. YUMMY! Thank you so much for participating in OTMM. You bring a great menu loaded with exotic flavors to us all! Your Lamb Shanks look amazing! Thanks for sharing and have a great week! Martha: Eureka! I think you found the recipe. Thanks so much. I believe I shall wait for a cooler day to attempt the dish. I'd love to have Anna's "Loaves and Fishes" cookbook but have only found some very expensive copies on line. I plan to keep looking because I've had several excellent cooks, including you, recommending it. The lamb shanks looks falling-off-the-bone delicious! Martha: I am sorry to say- I have never made lamb in my 43 year marriage - time to expand here! This looks lovely and I remember Judith from the "movie". Oh, that sounds really good! I love lamb. I am also going to have to look for that cookbook. I just love new cookbooks. Thanks for the suggestions!